A very delicate & simple combination of lustrous peach pearls & glistening peach crystals that are sure to make an elegant statement on your wedding day! 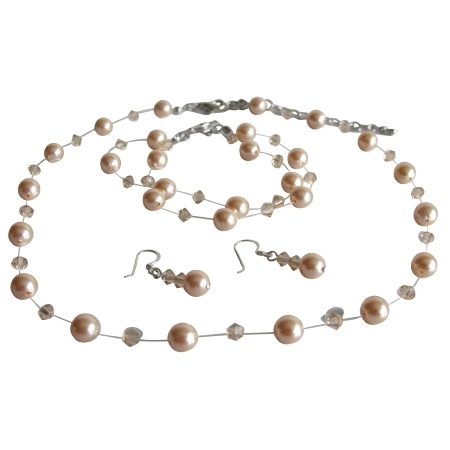 The Peach Pearl & Crystal Jewelry Set is perfect for brides or bridesmaids. Necklace earring & bracelet set is crafted with an invisible strand featuring beautiful Swarovski Peach Pearls & Peach Crystals. This necklace is the perfect addition to your wedding prom or homecoming. Fine invisible necklace gracefully floating pearls around your neck at affordable complete jewelry set with Sterling Silver 92.5 hook earrings & Double stranded lobster clasp Bracelet will make a great & very affordable bridesmaid jewelry.